Is your living room really a 'living' room? A living room remodel is an opportunity to rethink and redesign a fundamental room in your home. You're given a chance to make it more ‘livable’. What do you actually use your living room for? What would you really like to use it for? Maybe you want to entertain more guests or you’re tired of tiptoeing around furniture you hardly sit on. It’s time to take a critical look at this fundamental room and how it functions in your family’s day-to-day. How can a living room remodel improve your entire home environment? The good news is that unless you have an open floor plan, a living room remodel will only be confined to the living room, meaning that unless it’s already the hub of your home, your daily activities won’t be affected. You can take your time or cram as much bustle into the space as you want without too much hassle. Gather your thoughts and ideas for the new space into one organized place and get to planning. Figure out a timeline, a budget, a contractor or several; basically the entire vision for your living room remodel. Once you’ve got a handle on the logistical constraints, you’ll have more room to get creative with design. Unless you’re doing an entire living room remodel overhaul, you’re probably going to be keeping some of your existing furniture or design elements. Make sure these factors will flow nicely with your new design. Experiment a little, play with what works, don’t be afraid to copy something you may have seen in a magazine or blog post. Consider your surroundings as well. If you’re knocking down a wall or opening a side of the house to a view, how will that play into your design? Is stone flooring really the best option living in a cooler climate? Perhaps your space gets more than enough natural light and adding track lighting might be unnecessary. You can also take this opportunity to integrate the latest in design and technology. 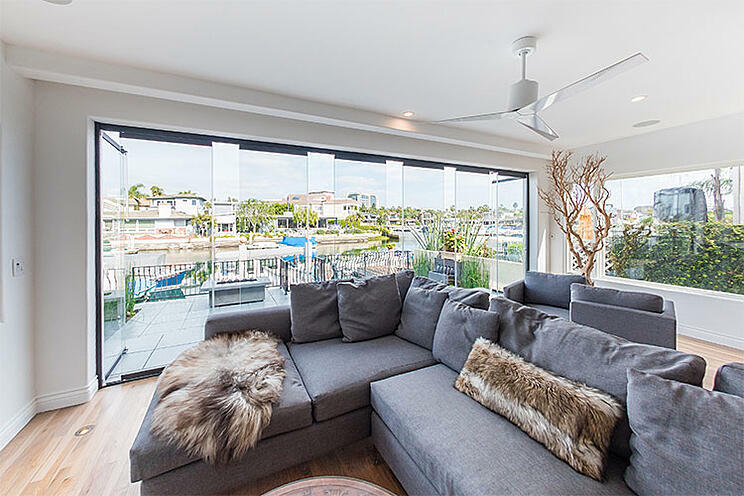 Take advantage of the phenomenal view behind those walls with a frameless sliding glass door system. Try integrating self-automated or remote-activated appliances, like Nest Thermostat or having your own personal virtual assistant help you with your home settings (Amazon Echo). 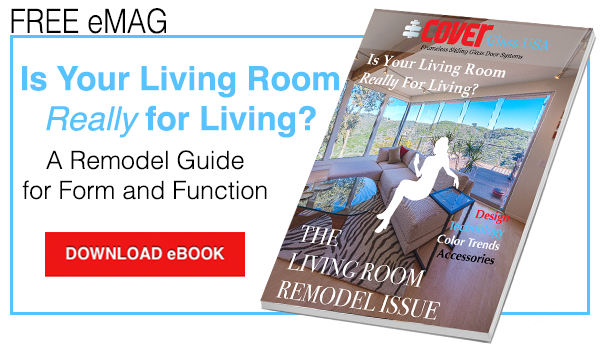 For a more in-depth look at living room remodel and renovation, download our latest eMag.